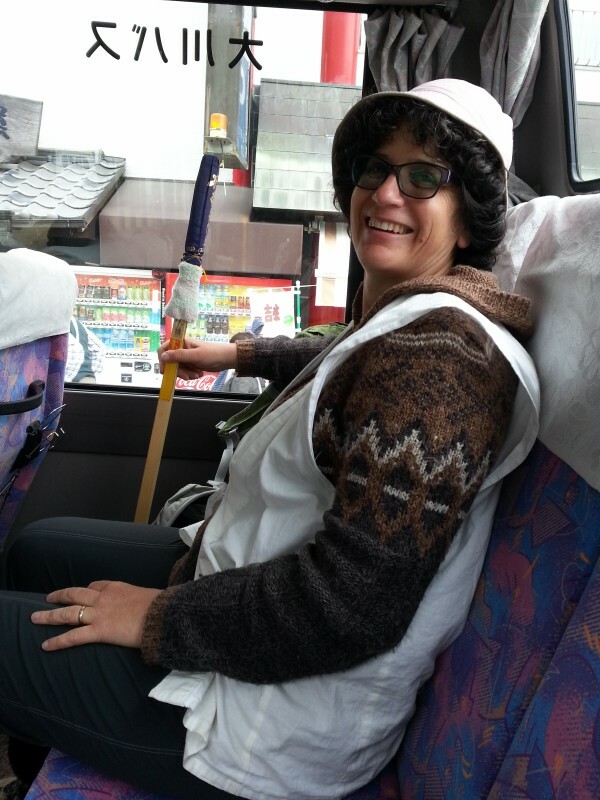 Since we used the bus and train for our pilgrimage, we had unanticipated extra time at the end of our trip. Ann was interested in visiting Kyoto, and I am always up for a trip to my old hometown of Kobe. I also was interested in going to Mt. 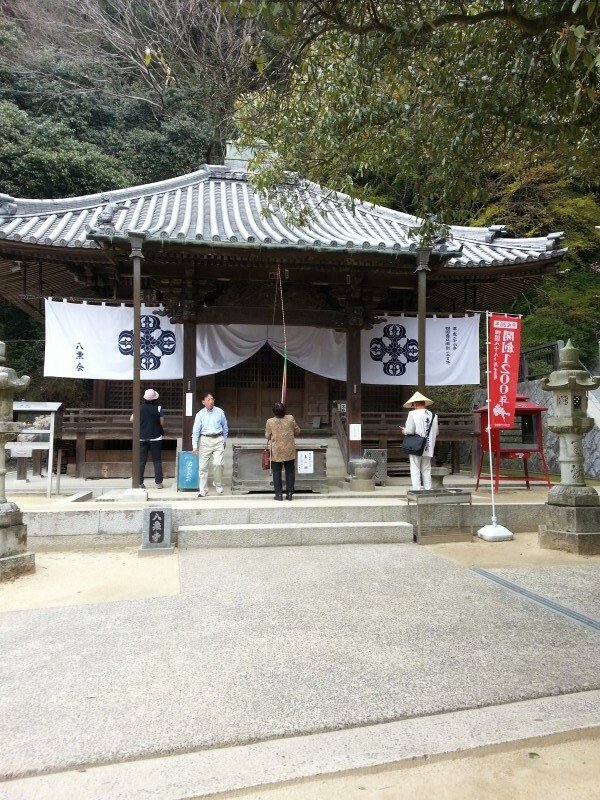 Koya, the traditional place to begin and end one’s Shikoku Pilgrimage. 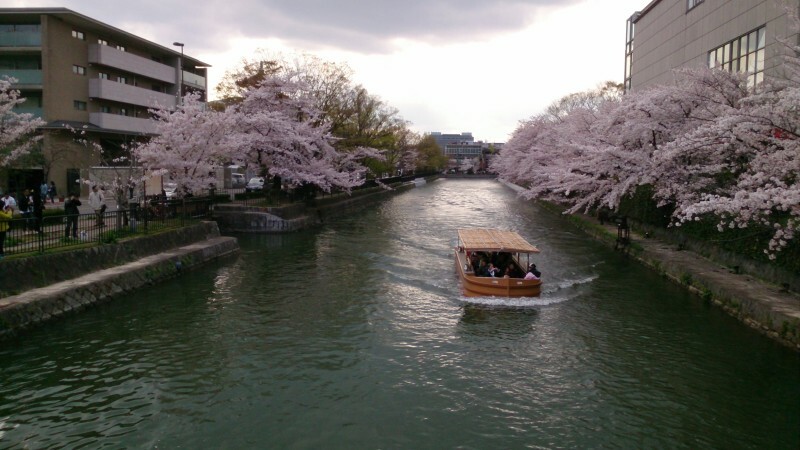 We took the bus from Takamatsu to Kyoto, arriving on a weekend at the very dizzying height of cherry blossom season. The city was packed with tourists. I felt like the country bumpkins, agape, coming to the big city. We had just spent the last five weeks or so wandering around the hinterlands of Shikoku, a place where the city of Matsuyama (population of half a million) is a lot of people. Now, we were in the Kansai megalopolis, population of more like 23 million people, in arguably the tourist epicenter of Japan. There were so many people. There were so many gaijin. It was overwhelming. 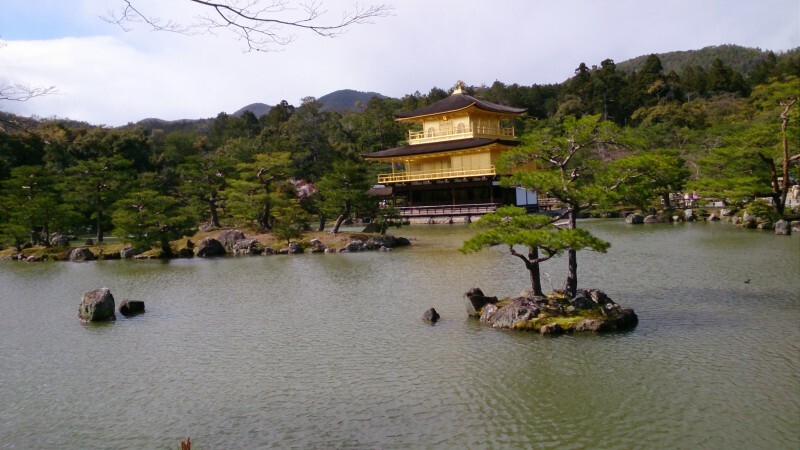 My goals in Kyoto were to see two tourist attractions that I missed the last time – the Golden Pavilion, and Ryoanji. Did we see these? Yes. Did ten trillion other people seemingly go there? Yes. We also did the Philosophers’ Walk. 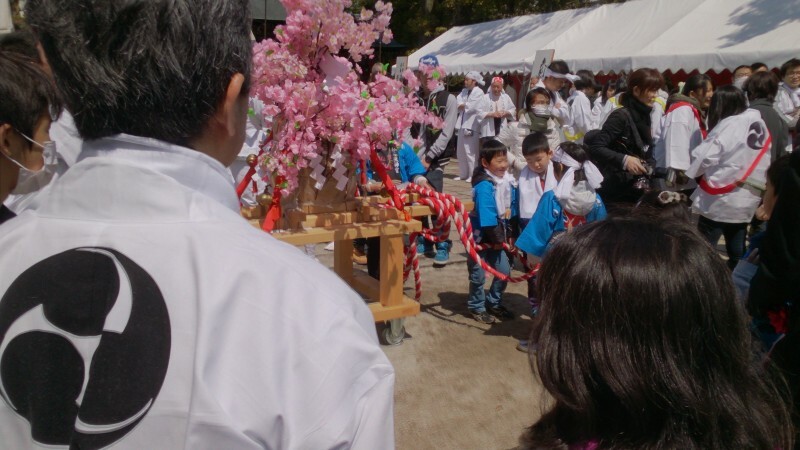 Doing this famous stroll at Hanami, cherry blossom viewing season, on a Saturday was a bit nuts. Think of the density of sunny Bumbershoot, and you’ll get the sense of this. We visited the Silver Pavilion along the way. We dodged off the path for lunch, and went to a little hole-in-the-wall nigiri (rice ball) establishment. 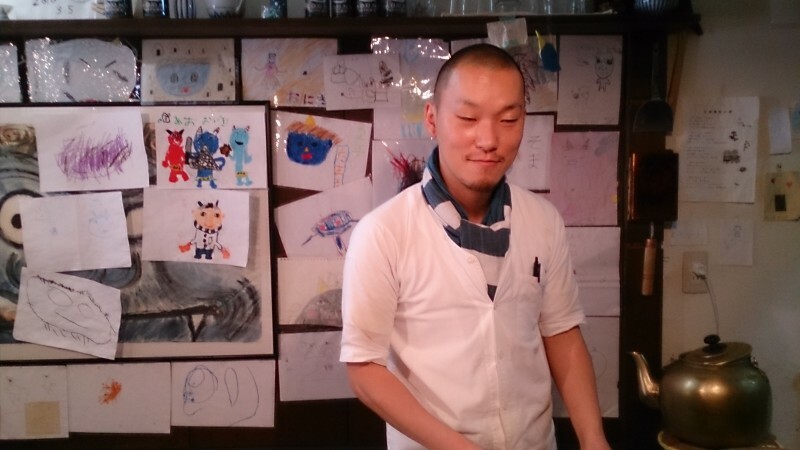 I chatted with the nigiri maker – he was impressed that we had completed the 88 Temples of Shikoku pilgrimage. When he asked why we did it, and I translated what Ann said, “to be closer to God”, and I told him, to gain divine guidance, I think he got nervous that we were a couple of religious nuts. Heh. 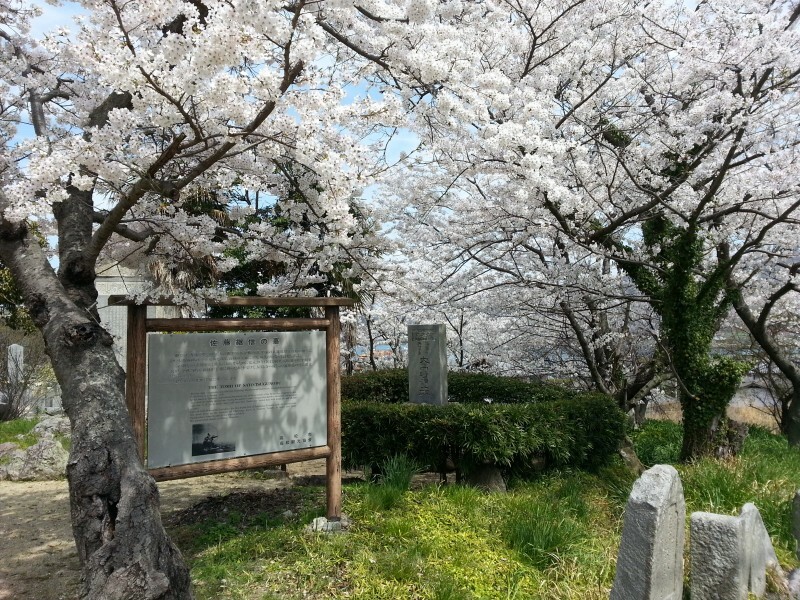 I think it’s much more acceptable in Japan to do the pilgrimage in honor and memory of a dead relative than to do it for any true spiritual purpose. 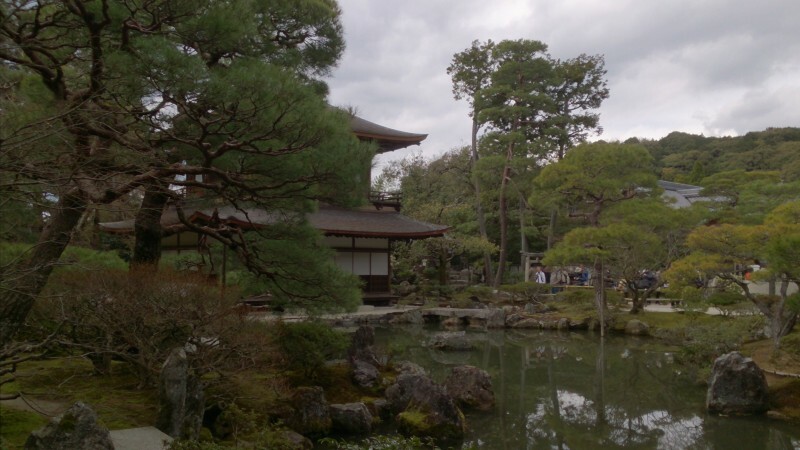 After this, we walked to see the Heian Shrine, and then went to the Kyoto Museum of Traditional Crafts. This museum not only had displays of the many traditional handicrafts, they also had galleries of contemporary artisans working in these crafts. I bought my brother a birthday present here. The next day, I took off by myself to go to the headquarters of Rinzai Zen, the denomination that I studied under when I lived in Japan in my salad days. I had completely forgotten that this set of temples contained my most favorite garden in all of Japan, and it was beyond my dreams to stumble on it again. I love this garden because of how it takes the hardscape and rectilinear lines of the building, and carries them into the plantings, and slowly eases the squares until they fade into the softscape of the shrubs and trees. 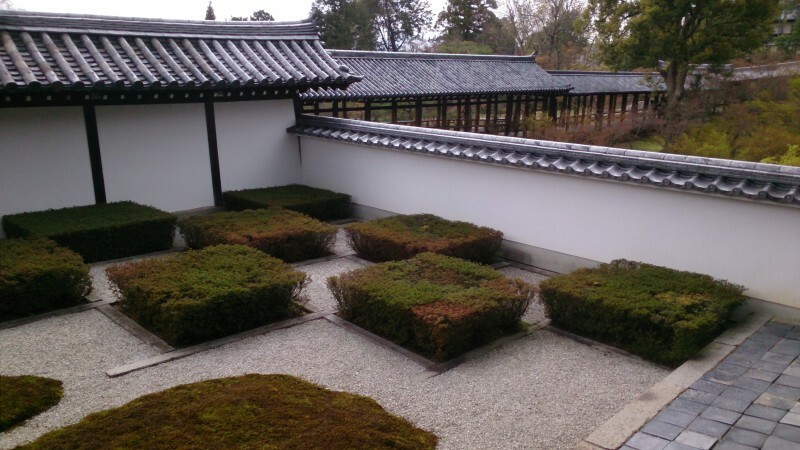 I believe that this garden is set up to be a three dimensional representation of the meditative process – to go from ordinary consciousness, with its rules and limitations, and unnatural straight lines – to meditative consciousness, soft, lush, green, and natural. It’s clearly set up as an autumnal garden – there’s not a single cherry tree – but lots of beautiful maples, and it would be stunning in the fall. I could sit on the veranda and look out at this garden forever. 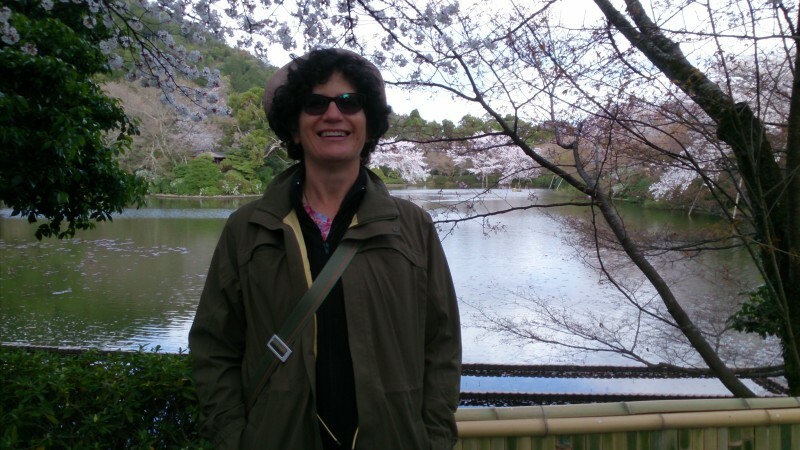 I didn’t though – I called Ann, and we rendezvoused over at a shrine at the north end of town, that was going to do a cherry blossom festival. 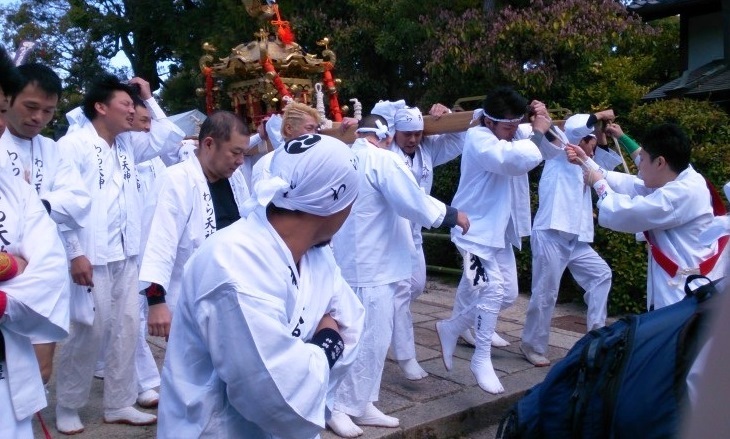 They carried out portable shrines out on to the street with drums and dancing. First came the children, with a shrine that was on wheels, and could be dragged. They had some adults helping them. Then the women came out, carrying their shrine. 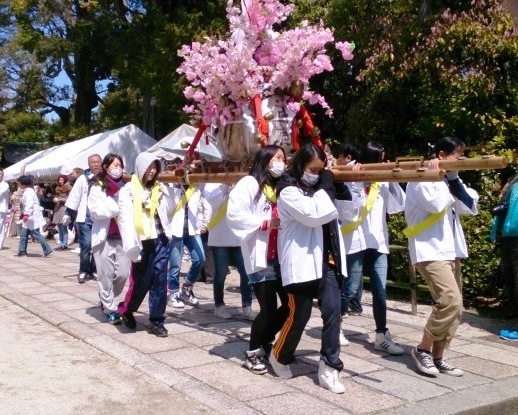 Then the men came, carrying the largest and heaviest shrine. They worked in shifts, because of the difficulty of carrying the load and doing the dance step at the same time. After we saw their parade, Ann and I went to eat some Italian-ish food nearby. After lunch, we split up again, and I went to see some Zen gardens that were only open for a week or two during this time of the year, because of the great crush of people who come at cherry blossom season, while Ann saw some more generally splendid and famous World Heritage Site temples. 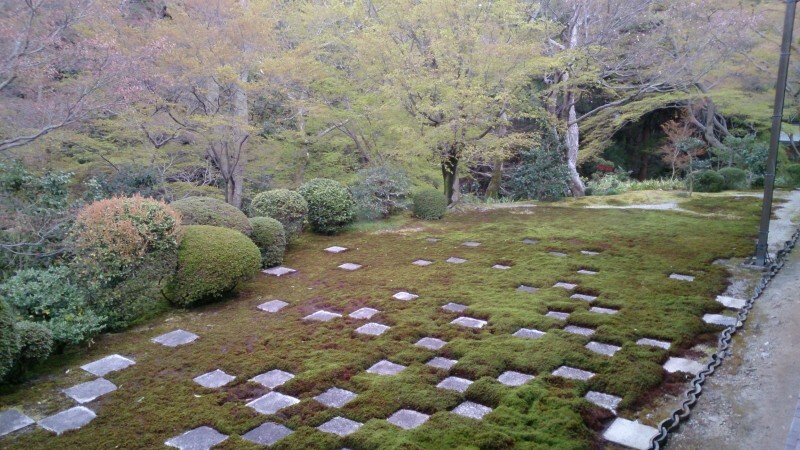 While these were interesting to view, and I appreciated the rare opportunity to walk through them, none touched me as much as the Rinzai garden that I saw that morning. Chanting at Temple 87 with a monk and another pilgrim. 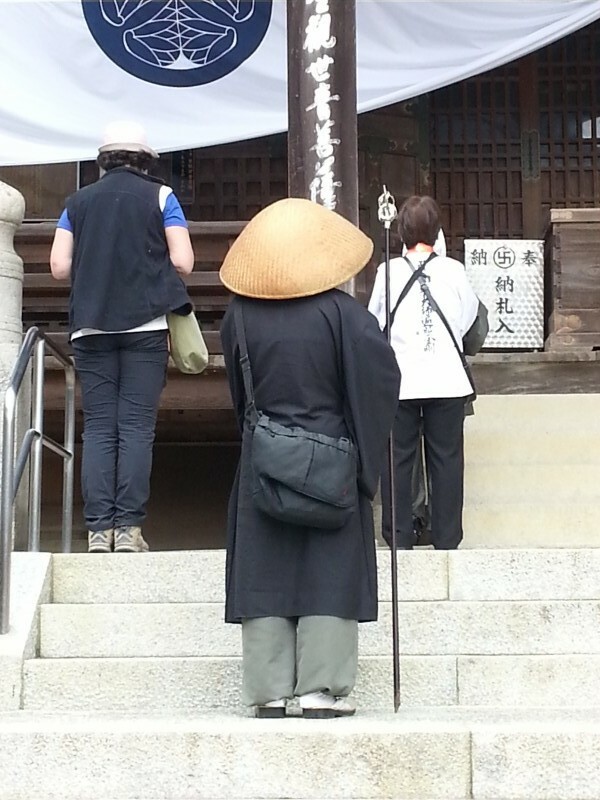 This was our final day on the Shikoku Pilgrimage. We took the train to the end of the Kotoden Nagao line, and walked about five minutes to Nagaoji. 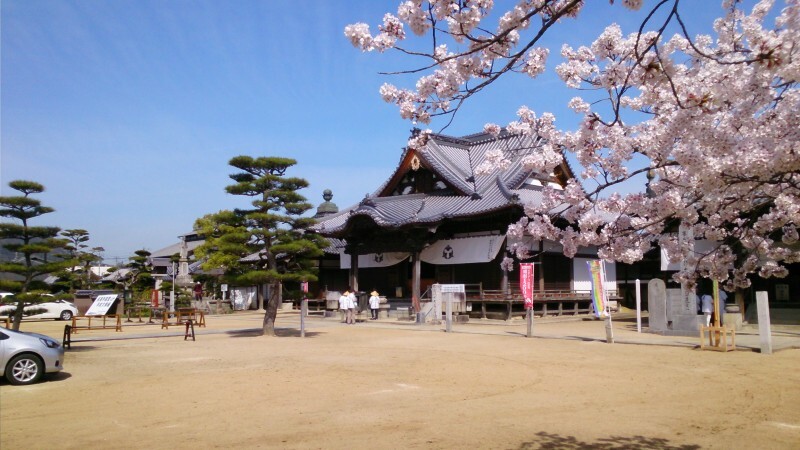 Nagaoji has a wide and spacious feeling to its temple courtyard, and a beautiful roof line on its main hall. Since we were coming to the end of our journey, I did a full set of prayers and chanting. 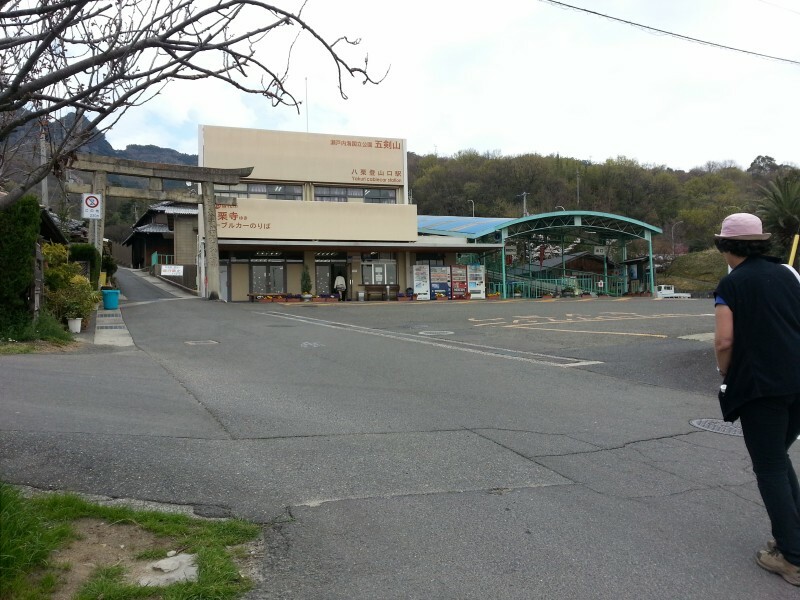 After we finished at Nagaoji, it took a little backing and forthing on the main road to find our bus stop. We should have been able to identify it because it had the 1200th Pilgrimage Anniversary banner right at the stop – duh. We waited for a good hour for the community bus to arrive. Walking through the temple gates – you can see Ann ahead. After the few locals were dropped off at places like the local rec center, all the remaining passengers were pilgrims. 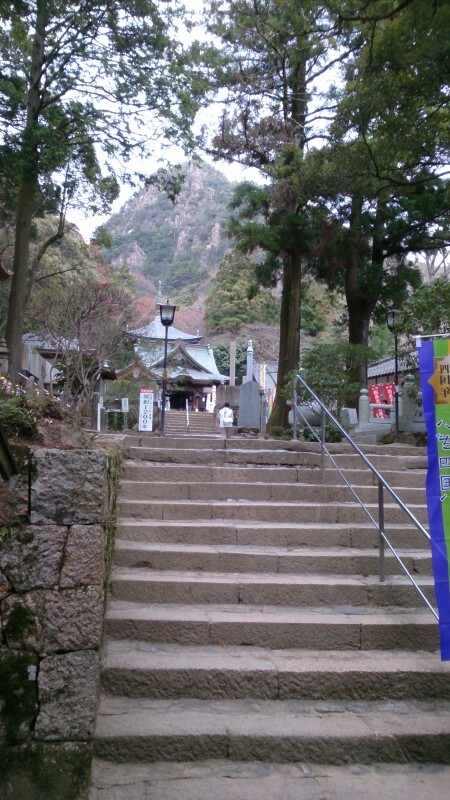 The bus climbed up into the mountains, winding its way until we reached Temple 88, Ōkuboji, located less than a kilometer from the summit for Mount Nyotai. 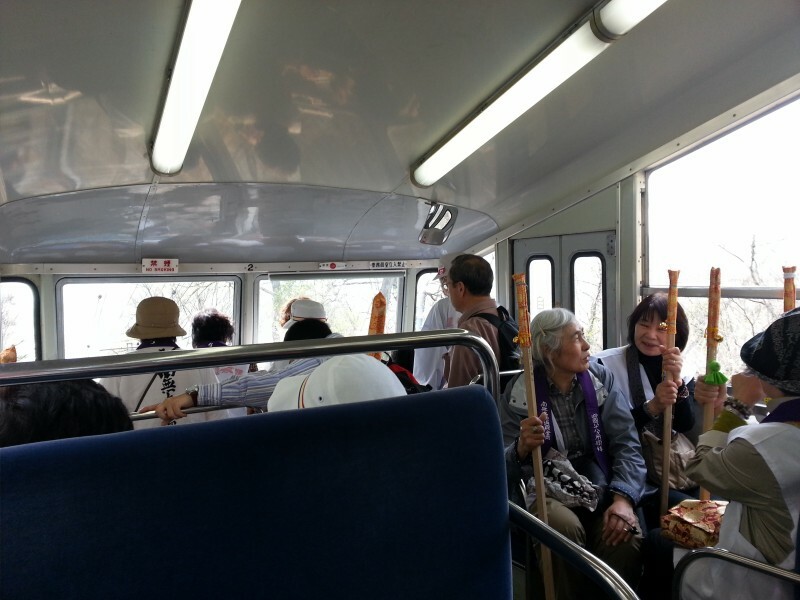 In my excitement to reach our final destination, I left my walking stick on the bus! 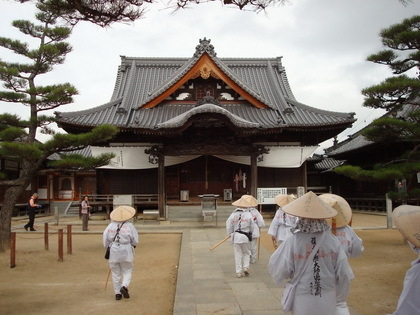 Since this is the final temple on the pilgrimage, it was one of the larger complexes. 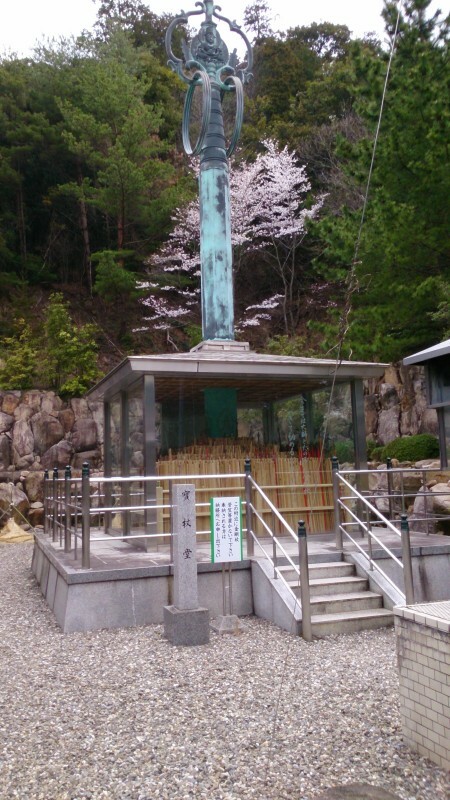 Many pilgrims leave their staff at Temple 88 to be burned, and we saw hundreds of staffs collected for this purpose. Even if I had wanted to do this, I couldn’t, as my staff was now wasurimono. 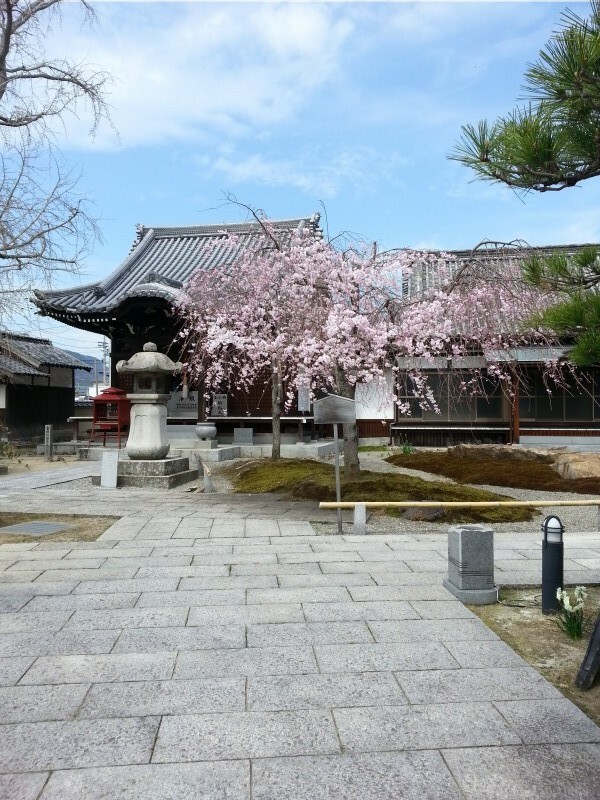 Since this was our last temple, again, I did all my prayers and chanting to completeness. Then, we went to the stamp office to have our nokyo books stamped. 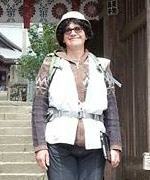 There, Ann and also completed a survey (they had them in several languages) about our experience as pilgrims. We also walked around the general area of the temple, where we could see magnificent views into the valley. As I looked at the beautiful mountains, I thought seriously about walking down at least part of the way, rather than taking the bus back to train station. But this seemed unnecessary. I was now done. So we ate our lunch, and waited for the bus. When the bus appeared, there was my staff, right in the front! So it was not permanently wasurimono, and I was glad to have it back with me. We returned to Nagao, then got back on the train, and rode it all the way back to Takamatsu. Ann and I went to an Irish pub to celebrate our completion of the pilgrimage. We ate fish and chips, and drank Guinness on tap, and chatted with the barkeep, a half-Japanese, half-Sri Lankan guy without any Irish blood. He gave us a little Ceylonese curry to use as a dip for the chips. Ann is sufficiently in touch with her Irish heritage that she impressed him with her ability to sling Gaeilge around. This was a jolly end to our last official day on the henro trail. 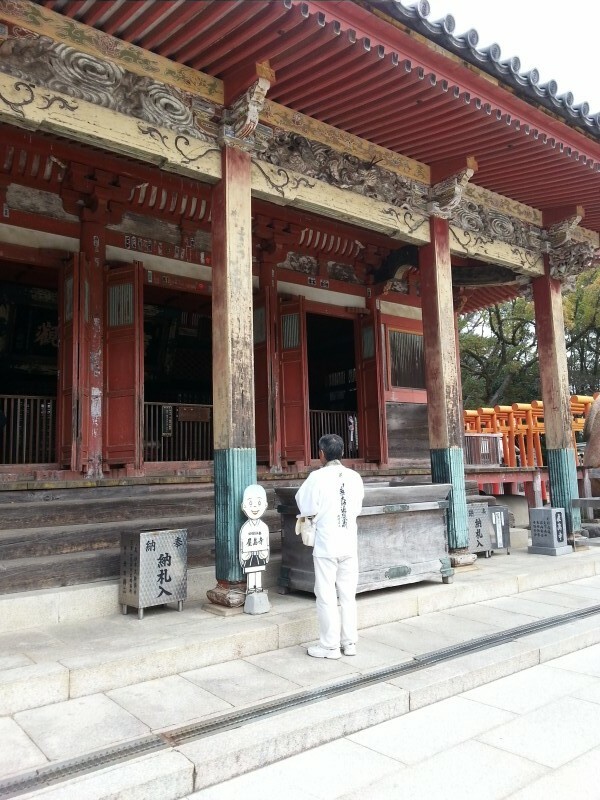 This day was devoted to visiting the remaining temples in or immediately around Takamatsu. We took a little train that got us about 45 minutes from Temple 84, Yashimaji. This temple was at the top of a lava plateau, nearly 300 m tall (about a thousand feet), and the climb up was pretty steep. We could see a funicular track, and out of curiosity, we walked to its base. It was clearly abandoned, its paint peeling. 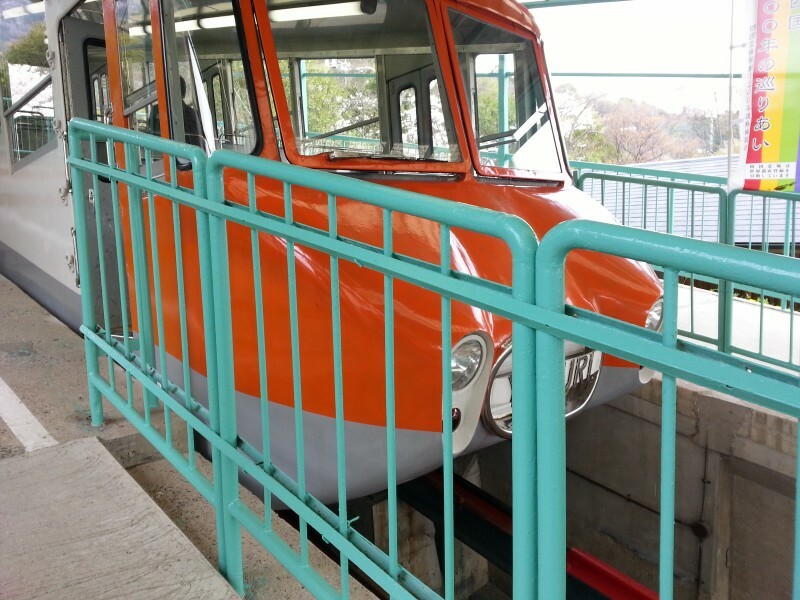 It is possible that when they built the toll road to the top of Yashima, the funicular went out of business. Well, we weren’t taking either one – we found the walking trail instead. There were a number of people walking up the hill, either as pilgrims, or perhaps on a morning constitutional. We finally made it to the top, and entered the temple gates. 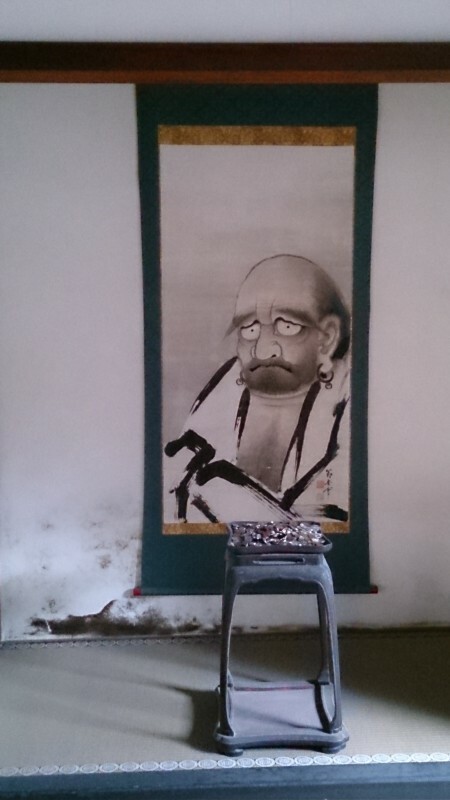 The stately main hall for the temple had fading paint, which I felt made it look more charming. 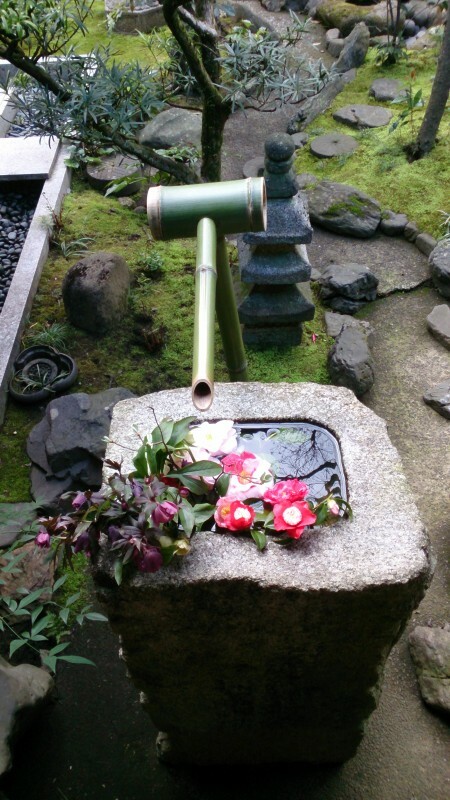 Immediately adjacent to the temple was a Shinto shrine, honoring the tanuki, an animal sort of like a badger or raccoon. Tanuki are very popular in Japanese folklore, and you see statues of them all over Japan. Since it is reputed to mate for life, a tanuki is symbolic of marital happiness. 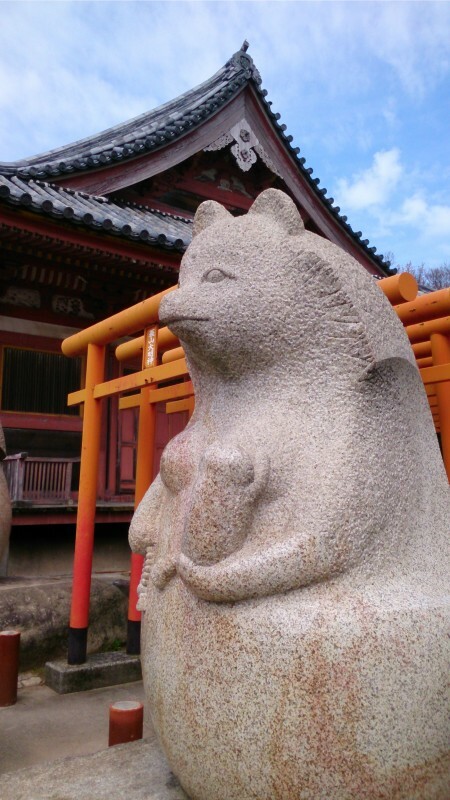 This particular shrine was devoted to the tanuki as loving mother, and it had a statue of a tanuki with rather human-like breasts, nursing a cub. We also visited the temple’s museum. Many temples have ancient artifacts, but no way to display them , so they just come out once a year, or on special occasions. I figured it was worth five hundred yen to thank Yashimaji for having some way for the general public to view their treasures. After we got our book stamped, I asked the way to the trail to leave the mountain, and the temple staff person said that we would be well served by walking to the viewpoint before we left the hill. So we came back out the temple gates we entered, and then walked out to the viewpoint. 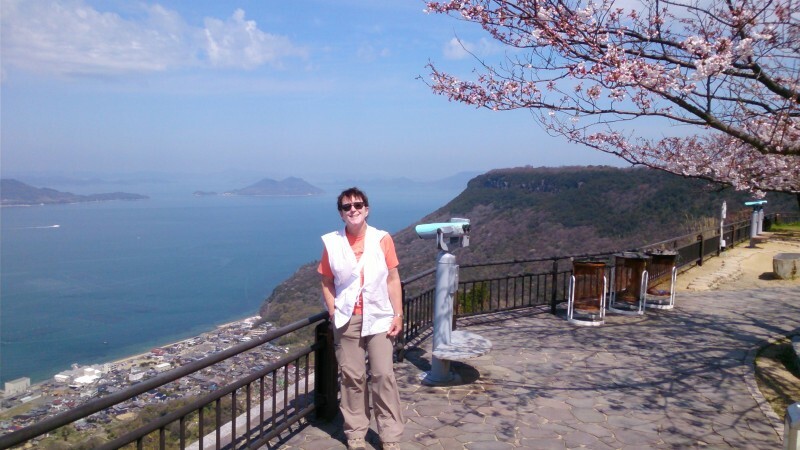 She was right – it was well-worth the additional walk, as we could see not just central Takamatsu, but out over the islands of the Inland Sea. 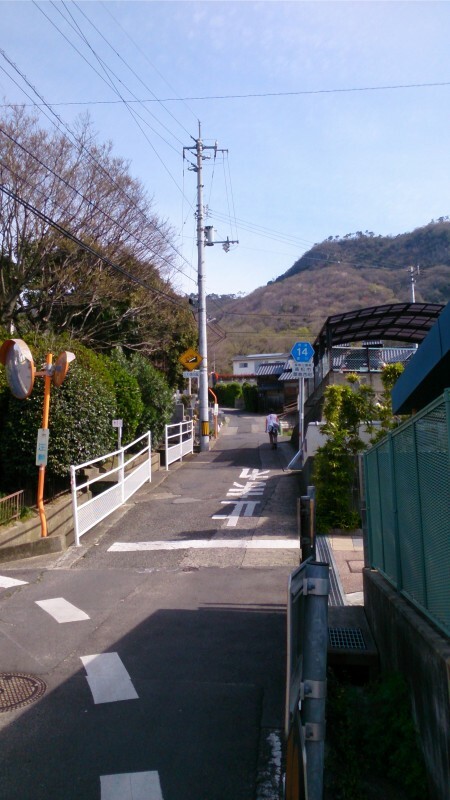 We walked around the top of Yashima, and saw a large abandoned building next to the abandoned funicular station. It looked like a dormitory to me, but maybe it was an old hotel? Ah, the wonders of the internets – the answer (and many more pictures) is here. The trail on the way down was a lot steeper than the way up, and I sorely missed my pilgrim’s staff, which I left back in the hotel room. 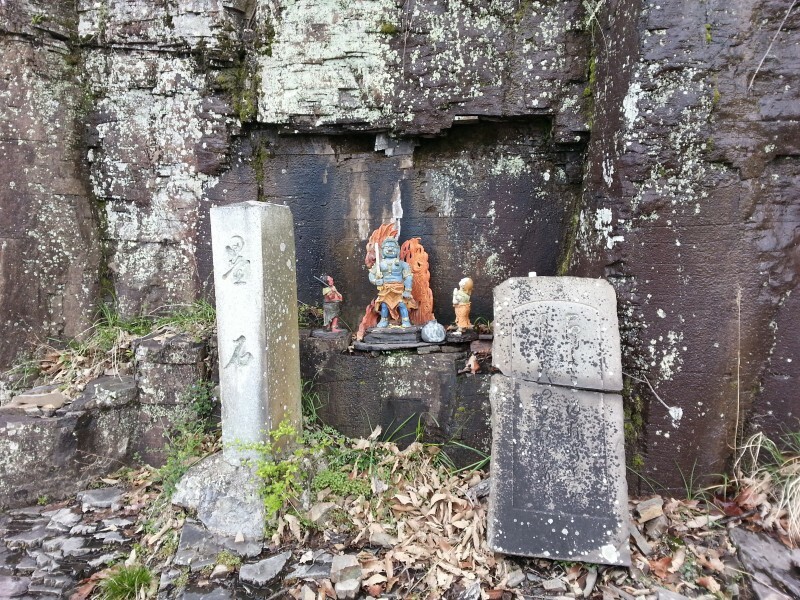 We needed to return to sea level, so we could climb up to the next hillside temple, Yakuriji, Temple 85. We crossed the water. Now, we were coming up the next hill, and my eyes were peeled for the noodle shop indicated in my map book. I had nearly given up hope, but it appeared, and we got lunch. 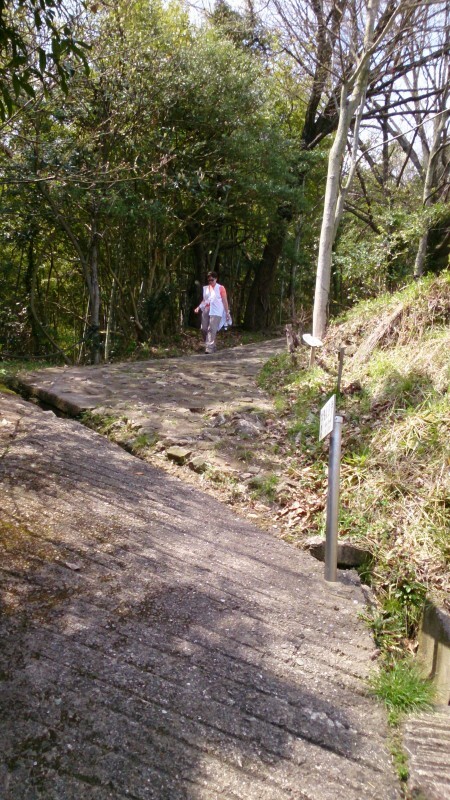 Unlike the previous hill, this one had a working funicular to get us to the top. It was also just a bit higher up than the previous hill, so we sprang for the fare. We didn’t have to walk far to reach the temple. The temple complex burnt to the ground during the Warring States period, and suffered again during a major earthquake about three hundred years ago. 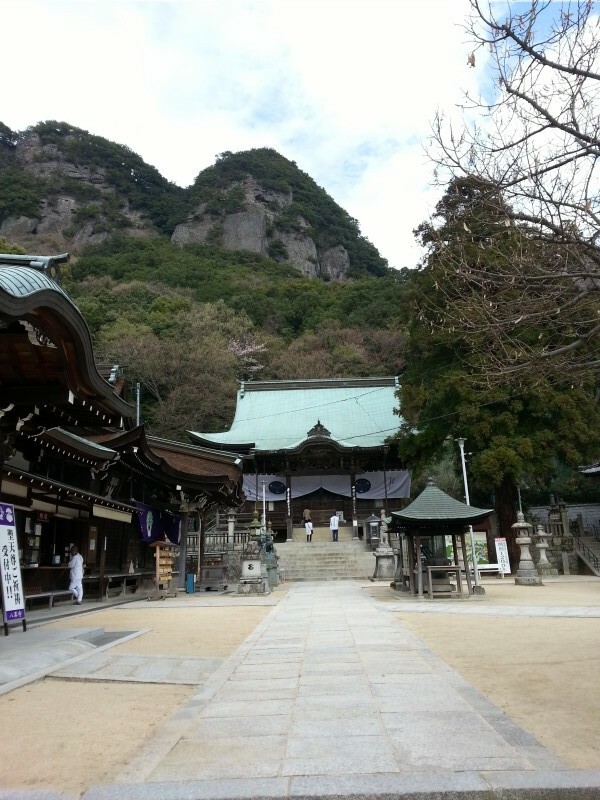 The mountain on which this temple sits is famous for its granite quarries. On the way up, and then on the way down, we saw many small granite carving places, where they make statuary for gardens or funeral markers. We saw a somberly dressed family apparently choosing a headstone as we walked along. Shidoji was our final temple of the day. 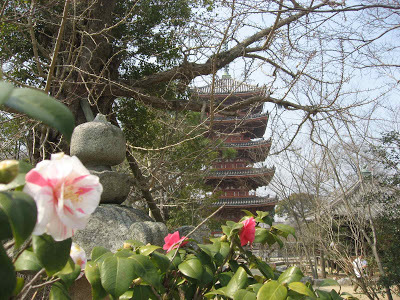 You can see its five story pagoda from all directions. It was established in 693 CE, but burnt down six times before 1500 CE. The King of the Dead is the patron spirit of this temple, and each time it was destroyed, someone went to his kingdom to get his blessings on the new construction project. After we finished at Shidoji, we were to take the local train back to Takamatsu. Clearly I was too tired, because I guided us on to the express completely in the opposite direction. The conductor was bemused by our predicament, but also let us know that he would only let us return on a local (getting us back to Takamatsu maybe – maybe – before bedtime) unless we ponied up 500 yen to be able to correct our error using an express. It took a good half hour before we could even get off the train, and then we had to wait for one going the other direction, and even with it being an express, it was still an hour’s ride back into town. When we finally got there, we ate at an Italian restaurant in Takamatsu. I drank my only glass of red wine on the trip there.